Use a sunflower to make a bird feeder for your garden! Pick a sunflower and poke sticks through the base of the flower for bird perches. 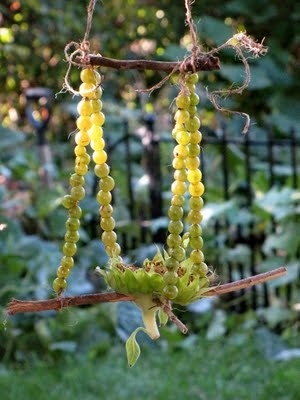 Cut pieces of string, tie the string to each stick and use an upholstery needle to feed grapes onto the strings. Tie the ends of the strings around a stick, and tie another string to the stick to hang the bird feeder from a tree branch.